Keep your Hearing Aids working like new! 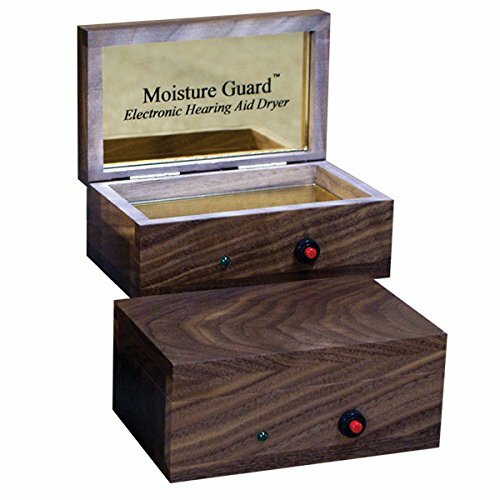 Remove moisture, oils, and earwax overnight by cleaning them with the Moisture GuardTM Electronic Hearing Aid Dryer. It's also perfect for musician's in-ear monitors and ear buds. The Moisture GuardTM creates dry heat which evaporates moisture, liquefies oils, and dries out earwax for easy removal. This type of regular maintenance extends the life of your hearing aids, keeps them working at their peak performance, and helps prevent costly repairs. The interior top and bottom are fitted with gold mirror. With single push button on/off, and an indicator light which illuminates when in use, the Moisture GuardTM is easy to operate with nothing else to buy. Turn it on at night; turn it off in the morning without further expense. Protect your investment for years to come. The Moisture GuardTM pays for itself by avoiding the cost of just one out-of warranty hearing aid repair. Dimensions are 5 1/2" wide, 2 3/8" high, and 3 3/8" in depth (front to back). Unit comes with a 110-240 12vac standard wall-type power supply. One Year Warranty, Audiologist recommended. This type of regular maintenance extends the life of your hearing aids, keeps them working at their peak performance, and helps prevent costly repairs. View More In Dryers & Cleaners. If you have any questions about this product by HearMore, contact us by completing and submitting the form below. If you are looking for a specif part number, please include it with your message.